You don’t have to undergo guilt pangs about leaving your doggie or cat behind at home anymore. Ask anyone who has a pet about the toughest part of their day and they’d say it is when they have to lock the doors of their house to step out for work even as their pet looks at them with pleading eyes, begging for play time. Pets become members of families and taking care of them, becomes the number one entry on people’s priority lists! Bengaluru is warming up to the idea of taking these furry friends to work as workspaces are becoming increasingly pet friendly. Here is what pet parents and animal lovers across the city have to say about this. Pushpalatha N S, a lawyer by profession has a two-year old Indian Spitz who accompanies her to her firm sometimes. “This is a very welcome move by work places. As a dog parent, I am constantly worried about my dog if I leave him alone for too long, unattended. Nothing like taking your pet to work and spending all your time with them!” she adds. Many start ups in Bengaluru have their very own in house pets, who brighten up the office and become the best stress busters. Graffiti Collaborative is one such company which has warm, furry co-workers who enliven the entire atmosphere! “It is a conscious call on our part to include animals as a part of our office. We let them come into our business meetings and take them for our anniversary travels as well! We have adopted four dogs and a cat. The challenges we face are in terms of taking care of them and getting them used to certain clients who might be wary of animals, but for the most part, people are happy to see them around!”, says Shinoy Thomas from the team. “Pets make the best companies for coffee breaks! 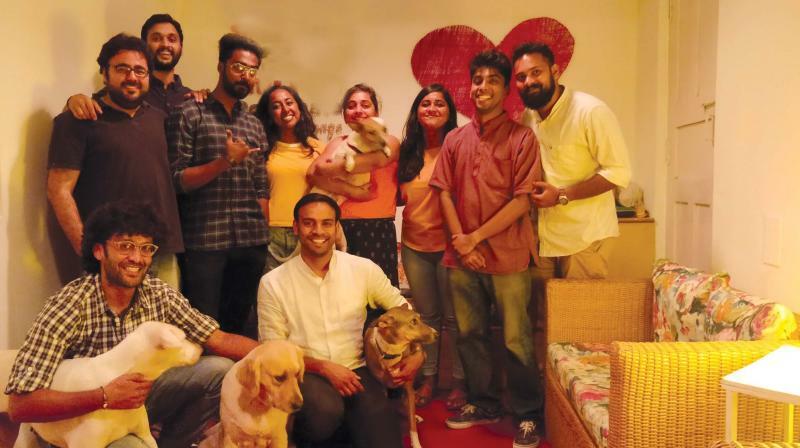 I believe that people who are tolerant of pets have more empathy and this makes for great team building!” says Arpita Ganesh, the owner of Buttercups, another start up that has in house pets and encourages employees to bring their pets along! Who doesn’t love the colorful, artsy Chumbak stores? Along with the vibrant hues of their store, they offer a wholesome experience of happiness and positivity with their playful in house pets who are ready to conquer the blues! Their in house Labrador, Hugo is called the ‘Chief Pawsitivity Officer’. “Hugo’s day is mostly about playing with anyone who’ll indulge him and then snoozing on his favorite rug in the office. But he sure is a huge part of everything we do!” says the team in their blog. In today’s world of workaholics, pets around workspaces prove to the best stress busters!